A dripping faucet is one of the most common household problems. It may seem like nothing more than a nuisance that keeps you awake at night. But the truth is, a leaky tap could lead to huge water bills and even flooding if left untreated. A constant drip should be fixed immediately as its consequences could range from slightly annoying to catastrophic. According to the Saskatchewan Watershed Authority, a tap that drips six drops a minute will lose 1,200 litres of water annually. That’s the equivalent of seven bathtubs. So, apart from the water stains and drained clogs, a dripping faucet is also environmentally wasteful. Homeowners can often fix the problem themselves if they have the right tools for the job. But how can you repair a faulty tap if you don’t know what’s behind it? 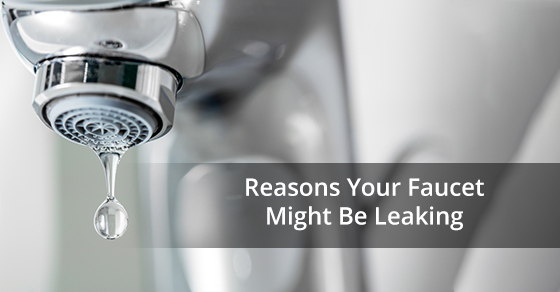 Here are four reasons why your faucet might be leaking. Over time, you may have tried to stop a leak by turning the faucet knobs tighter. But this only damages the valve seat and washer as you grate them against each other. Most leaks can be fixed by taking the faucet apart and inserting a new washer at the end of the spindle. Sometimes, however, a valve seat can be so worn that even a new washer will not be able to form a tight seal. These valve seats can also become corroded by mineral build-ups and abrasive particles in our water. If your home has a washerless faucet, the repair method will be different. Take a good look at the O-ring that wraps around the outside of the stem. This crucial piece is used to hold the faucet’s handle in place. Drips often happen when this O-ring wears down or becomes loose. If you have a cartridge faucet, take a look at the cartridge as it may need to be replaced. Purchase a matching cartridge in the correct size by measuring it carefully before and after removal. Water pressure is typically set by your municipality’s utility supplier. In most regions, an 80 psi pressure reading is considered ideal. Anything close to 100 psi and you’ll begin noticing issues with your plumbing system. Although many of us enjoy high water pressure, it is one of the most common causes of a leaky tap. Pressure that is too strong can mess with the water flow in your pipes. Water will not be able to flow smoothly from its destination, creating a backup. Since the excess water needs to find another route, it will start leaking out of the taps. Broken plumbing, such as cracks in the pipes or fittings can also alter your water pressure, so be sure to periodically inspect the area under your sink too. If you’ve ever heard of the term ‘water hammer’, it’s used to describe the loud thumping that occurs when excessive water pressure hits a valve. Apart from the irritating noises, this can be disruptive to your plumbing components. It’s best to get it looked at immediately if you suspect pressure to be the cause of leaks. Although you can try to fix pressure issues yourself, it can be difficult if you don’t have the expertise. This is why it may be best to call a plumber instead. Your plumber will also be able to tell you whether a water pressure regulator can be successfully installed. A sink and faucet is comprised of many components strategically connected to each other. But all of these parts may become loose over time. For example, if your faucet is leaking near its base, your adjusting ring or packing nut may have come undone with excessive usage. Use a wrench to tighten these components — you may have to make these adjustments periodically throughout the year. If your base is still leaking, you may need to replace the springs and seals. If you’re unable to identify which parts may be loose, contact your local plumber to assess the components for you. Tap water contains minerals and sediments that can build up in our plumbing system over time. Corrosion is a common problem triggered by this build-up, and it’s often the valve seat, in particular, that’s severely affected. Corrosion is the deterioration of metal as a result of chemical reactions. To avoid this, plumbers recommend that you regularly clean any hard water residue on the faucets and valve seat. You can do this yourself by soaking a clean cloth with undiluted white vinegar and wiping down the area. Although corrosion can be removed, many homeowners take this opportunity to replace the entire faucet — especially if it is aesthetically outdated and inefficient. For more information on your home’s plumbing, or for help with any plumbing issues, give Brothers Plumbing a call at +1 888-762-3401 or contact us here.